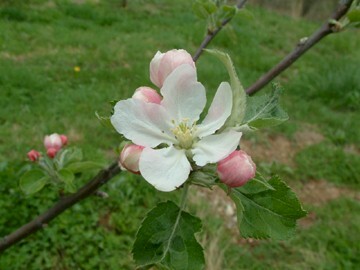 This historic old American apple originated about 1650 at Green’s End, Newport, Rhode Island. At the end of the 19th century, it was one of New York’s most important commercial varieties, surpassed only by Baldwin. It is a vigorous and long-lived tree but does well in the South only at higher altitudes. It is an excellent winter keeper and one of the best cooking apples available. It is a very fine substitute for the more commonly known Granny Smith. The fruit is large, uniformly round in shape and flattened on the ends. 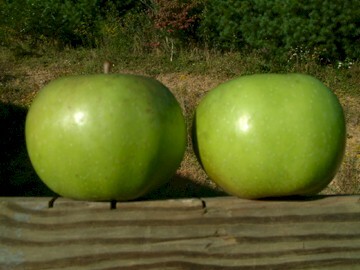 The dark, waxy green skin turns a greenish-yellow when fully ripe. The fine-grained yellow flesh is tender, crisp, juicy and quite tart in flavor. Ripens September to October and keeps until February or longer.